And then suddenly it was spring. The season we longed for seemed to leap upon us, turning our sea of frozen white to acres of mud and water. Not that we should be surprised, but the change was certainly dramatic. The snow we had on the ground held quite a bit of water. It had been partially melted and rained on- concentrated for lack of a better term. The soil below was frozen at the surface, preventing water from soaking in, and the soil below that was still full of water from last year’s wet fall and early winter rains. So when our recent warm temperatures and rain came along, water was forced to run off rather than soak in. Eventually, rivers took the brunt of the runoff, especially where they’ve been altered. People like to live near the water. We also like to try to make water go where we want it. Our rivers, however, have been here for tens of thousands of years and have developed their own management systems. A lot of that involves the floodplains which lie adjacent to their banks. Floodplains or floodways are inundated by water a couple of times during the year, typically. It can be during snowmelt, as we see now, or during really heavy rain events like we experienced last August. Where river water is constricted, its level rises until it finds a place to escape it’s banks, often man-made. This time of year, bridges can also cause problems as ice piles up against them, damming up the water and causing flooding. My dad had a blasting license, and I remember going with him near Manitou park to dynamite an ice jam for the City. (I think they have safer means of doing that now, but it was memorable.) And of course, we have to build elaborate systems of storm drains to direct water back to the river as levels subside. In nature, floodplains allow the water to spread out adjacent to the river, then gradually return as the water level drops. If the floodplain is permanently vegetated, the plants might also filter the water before it gets back to the river, holding on to sediment and nutrients which in turn feed the plants. Its a pretty nice system, saving a lot of money in damage to property, providing cleaner water, and creating wildlife habitat at the same time. It just means you won’t be able to build there, but that’s not a good idea in the first place, unless you have a house on stilts and a boat for access. Unfortunately, about half of these wetlands have been converted to something else, or were contained by levees and such, leaving people living behind them vulnerable. Wildlife is vulnerable too this time of year if they choose to live in a floodplain. Where I live, a herd of deer suddenly appeared in the yard when our bottomland forest was flooded, looking a little lost. I wonder about the meadow mice (voles) and shrews, which live in the grass, and how they cope with flooding. I imagine they have a hard time, and must either move or drown. 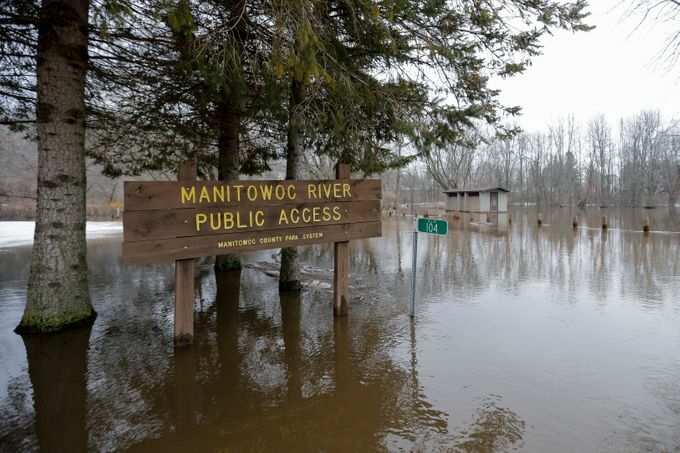 One study from Canada indicated that they re-colonize a floodplain more quickly if there is a variety of vegetation types present, and that more of them survive if there are not steep banks that must be climbed. Eventually though, these little animals make their way back into their dangerous habitat to start over, only to be displaced or drowned by the next flood. Life is not easy, I’m afraid. Still, other animals are adapted to high water like fish which migrate upstream in the spring. Without snowmelt, a lot of small streams would be impassable, and these fish, like suckers and northern pike, would be cut off from their spawning areas. Most of the Woodland Dunes preserve is a mosaic of wetlands covered by forest. Trees cut the wind and the snow settles deep. The trees, even without leaves, shade the snowpack just a bit, allowing it to melt gradually. A lot of that water seeps into the soil and some runs off- a clear, deep brown brew enhanced by dead leaves and downed branches. The whole preserve is like a giant sponge, storing and treating the water. The Dunes has always been wet, and it always will be, but we all benefit from the water having some place to go. Fortunately, in a couple of weeks the water will have gone where it needs to, and we’ll all be able to live a drier life. In the meantime, we hope for the best for everyone affected.